From the Walking Street main entrance, walk until you see Soi Diamond Sign on left side. Walk Up past large illuminated diamond sign until you see Katoeys Are Us sign and entrance. Taxis from central Bangkok or Airports will take approximately 2 hours driving South West. Baht buses run all over Pattaya and you can get off at Soi Diamond on Second Road and walk down until you see Katoeys 'Are' Us on the right side. 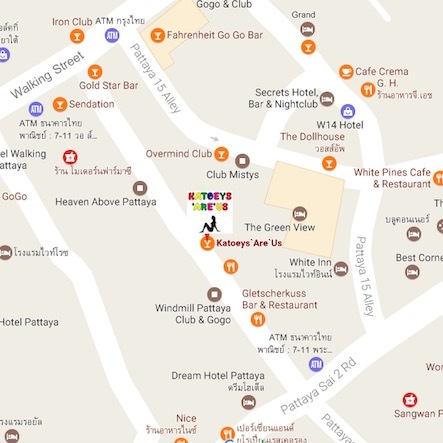 There are plenty of local hotels available all over Pattaya with rooms near the club for your pleasure.